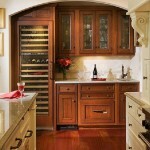 A front vented wine cooler is designed specifically to be built-in as part of your cabinetry. 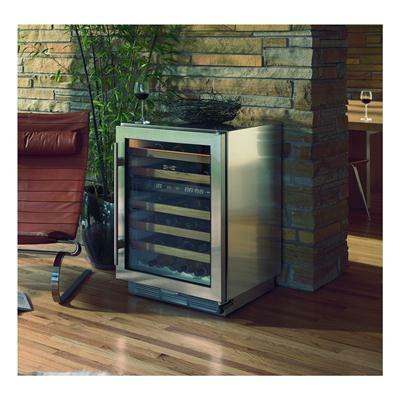 The venting of the cooling unit is located at the base of the front of the unit, therefore it requires no breathing space on either side or the back of the wine cooler. Front vented coolers allows for a neater, cleaner fit in your kitchen. Most of these models are available in counter top heights so they will easily fit under the existing counter in your kitchen or bar. Some larger pantry sized wine cooler models can store as many as 166 wine bottles and can be incorporated into a kitchen remodel. Front venting units feature some other important features such as, locking glass doors, dual zone and stainless steel cabinets. Front vented wine coolers are the perfect solution for your kitchen remodeling project. 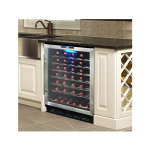 Front vented wine coolers can also be used as a freestanding installation and can be placed wherever there is an electrical plug and you have sufficient space.